A staple of marking tools in any sewing room is tracing paper and a tracing wheel. Use the closest colour of tracing paper to your fashion fabric you can get away with and still see your marks. White tracing will disappear under a hot iron. The other colours are more permanent. So be careful where you use it! Tailors chalk removes completely by simply brushing it off. Avoid the kind that has a waxy base—use only the chalky kind. Tailors chalk is also available in pencil form, and as a power you put in a tool, like a Chacoliner, that you run over where you want to mark. A thin line comes out of the tool, and is still easily removed by brushing away. Tailors chalk comes in white, as well as pink and light blue. Quilters silver pencils may work, depending on your fabric type and colour. They are meant to work well on cottons, such as quilters use, and may not show up on all colours. 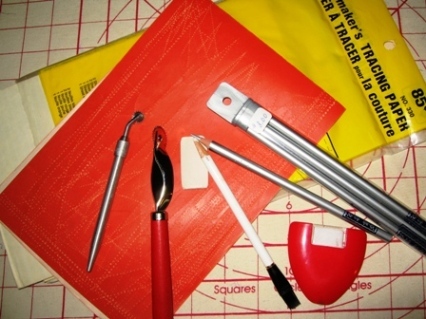 Sewing Tools from left to right, two tracing wheels, a block of tailors chalk, tailors chalk pencil, tailors chalk power in a marker, quilter's silver pencils. Underneath, is dressmakers tracing paper. Thread tracing or tailors tacks are a non-invasive way to mark fabric. This is the best marking method to use for tailoring on wool fabric, or anywhere on fine silk or other fabric that might be damaged by other marking methods. Use a fine needle and basting thread—the thread is easily removed when you don’t need it anymore. **AVOID** marking with a graphite pencil. These would be like ordinary writing pencils, but sometimes are sold to quilters as mechanical pencils with fine lead. I have had some very unfortunate experiences with graphite—it smears where you don’t want it to go, and it’s nearly impossible to get out—even with so-called “fabric erasers”. Using pencil lead is an old holdover from way back when—lead pencils were the only sewing tools people had to mark with and they used what they had. We have much better choices today!